Shropshire law firm Wace Morgan has stepped up its support for the Armed Forces by launching a new service. The Wace Morgan Military Law Service is designed to strengthen the firm’s links with service personnel and offer additional help and guidance to them. 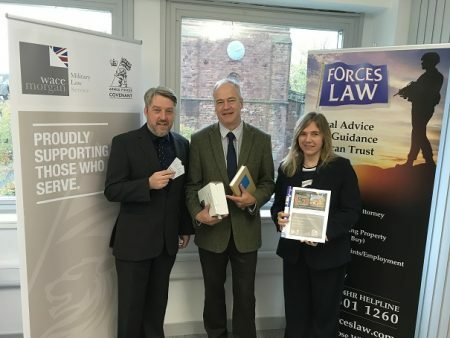 Wace Morgan has specialised in this sector of legal work for many years, being founder members of Forces Law, a national, independent network which provides a wide range of services to meet the legal needs of serving personnel and their families, as well as retired service men and women. Keir Hirst, a director at Wace Morgan who is also currently secretary of Forces Law, said that the new Military Law Service would enhance the firm’s work even further. “We are excited about the launch of The Wace Morgan Military Law Service. “Military law is complex with its own rules and it is easy to come unstuck. There are very strict time limits to progress matters and we recommend that clients take early advice. “We find that having a specialist knowledge of the unique legal issues raised in Armed Forces cases is a huge advantage and our new initiative will be more visible and accessible, reaching out to an even wider range of service people,” Keir added, explaining that the service would have separate branding, a dedicated email and phone and a separate Twitter account. Last year Wace Morgan signed the Armed Forces Covenant. This government initiative acts as a promise from the nation that those who serve or have served in the armed forces, and their families, are treated fairly when receiving any public and commercial service. A range of partners such as businesses, local authorities, charities and the public throughout the country were asked to sign a specially-drawn up document as a commitment to service people.